The 2003 vintage was a year of transition at this respected second-growth, as the enigmatic Bruno Borie took the reins from older brother Xavier, part of a reshuffling of properties their late father owned. 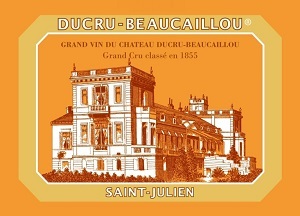 The 2003 matched the 1995 as the best Ducru-Beaucaillou ever. The château enjoys a location overlooking the Gironde, with 130 gravelly acres planted with Cabernet Sauvignon (70 percent), Merlot (25 percent) and Cabernet Franc (5 percent). 17,500 cases made. This is one of the finest Ducru Beaucaillous made in the last 20 to 25 years. Certainly in the spirit of the 1982, the wine is atypically opulent and viscous, but still carries its trademark St.-Julien elegance. Deep ruby/purple in color with a sweet nose of jammy cassis intermixed with flowers and some of the tell-tale wet stone/minerality of this estate on display, it is viscous, voluptuously textured, and exceptionally concentrated, with low acidity and relatively high alcohol for this estate (13%). This is great stuff that should drink reasonably well young but age effortlessly for 20-25 years. The final blend is 80% Cabernet Sauvignon and 20% Merlot. Anticipated maturity: 2010-2025+. Of course, this estate is now being run by Bruno Borie, the eldest son of the late Jean-Eugene Borie. He replaced his younger brother, Xavier Borie, who remains fully responsible for Grand-Puy-Lacoste and Haut-Batailley. The first vintage managed from start to finish by Bruno Borie, who replaced his younger brother, Xavier, at Ducru Beaucaillou, the 2003 is an atypically plump, juicy, fat, fleshy effort that does a terrific job of hiding its 13% alcohol. Yields were a mere 34 hectoliters per hectare. The harvest occurred between September 10 - 27, and two-thirds of the grapes made it into the final blend (80% Cabernet Sauvignon and 20% Merlot). The 2003 is reminiscent of the 1982 when tasted in March, 1983. Low in acidity with an evolved plum/purple/garnet color, it offers a sensationally fragrant bouquet of jammy red and black fruits, minerals, earth, and oak. Somewhat atypical for Ducru, it is opulent, viscous, pure, and juicy, with an exuberant, flamboyant personality. If it does not shut down over the next 1-2 years, it will drink well young, yet has the necessary richness and power to evolve for 20-25 years. This is sumptuous stuff! Intense aromas of blackberry, currant and cherry. Lasts for minutes. A blockbuster. A big, juicy claret. Gorgeous blackberry, licorice and raspberry with hints of minerals. Full bodied and super-long. Silky and beautiful. Really long and fine. You have to like this. Seductive and harmonious red that grows on you. It’s very rich in tannins but then shows lovely elegance. Almost 95-100.